Wipe Your Tears Charity are pleased to announce the details for their annual Tear Drop Ball. Wipe Your Tears provide wishes and support to children who suffer from terminal illnesses. 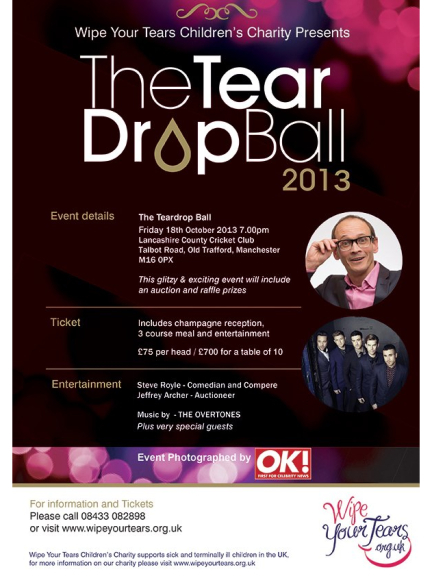 The Tear Drop Ball 2013 will be held at Lancashire County Cricket Club on the 18th October 2013 and will start with a red carpet champagne reception, followed by a 3 course meal. The evening will end with dancing and carriages at 01.00. World famous act The Overtones will provide the music, and comedian Steve Royle, who’s hosting the evening, will provide the humour. As well as the ball, there will be a fabulous auction and raffle. Lord Jeffrey Archer will run the raffle. Everyone who attends will also receive a goody bag. The ball is a perfect way to entertain customers or network with other businesses. Lots of them will be attending, including local and national companies, celebrity guests and regional and country wide media. The most important guests on the night though will be the children who Wipe Your Tears look so hard to support. After last year’s event the charity won a national award for Best Evening Entertainment. Tickets are only £75 for one person or £700 for a table of 10. If you can’t come to the night but still want to support the evening Wipe Your Tears have a sponsorship package available, with good promotion and marketing opportunities. You can also chose to donate an item for the auction. For tickets visit the Wipe Your Tears website or contact Damian at Cost and Expense Solutions on 08433 082898.